The winners of the 2010 Agatha Awards were announced this evening, given annually by Malice Domestic Inc. to honor the best traditional mysteries, those typified by the works of Agatha Christie. Thanks to everyone who tweeted the results, which are given below. ◊ Best Mystery Novel: Bury Your Dead by Louise Penny (Minotaur Books). ◊ Best First Mystery Novel: The Long Quiche Goodbye by Avery Aames (Berkley). ◊ Best Non-Fiction: Agatha Christie's Secret Notebooks: 50 Years of Mysteries in the Making by John Curran (Harper). ◊ Best Short Story: "So Much in Common" by Mary Jane Maffini (Ellery Queen Mystery Magazine). ◊ Best Children's/Young Adult: The Other Side of Dark by Sarah Smith (Atheneum). In addition, we believe (from various tweets) that Linda Rodriguez won the Best Traditional Mystery Novel Contest sponsored by Minotaur Books, though we don't know the title of her book. Previously announced honorees include the Lifetime Achievement Award to Sue Grafton and the Poirot Award to Janet Rudolph. The King of Diamonds by Simon Tolkien. A William Trave Mystery. Minotaur Books Hardcover, March 2011. Part whodunit, part police procedural, part Gothic romance, part legal/political thriller, this book weaves multiple elements from these various mystery subgenres into a single crime novel that work surprisingly well together. 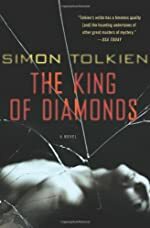 Read the full text of our review at Mysterious Reviews: The King of Diamonds by Simon Tolkien. Read the first chapter(s) of The King of Diamonds below. Use the Aa settings button to adjust text size, line spacing, and word density. Book Trends, a review site for young adult and children books, published several new book reviews this past week. We're presenting here a summary of those in the mystery/suspense/thriller category. For more reviews of children and young adult books of all genres, visit Book Trends; their reviews will amaze you! You can also follow Book Trends on Twitter. The 2010 Los Angeles Times Book Prizes were handed out last night to kick off the annual Festival of Books. The prizes honor the best books published in 2010 in a several categories. For Mystery/Thriller, the winner was Crooked Letter, Crooked Letter by Tom Franklin (William Morrow). 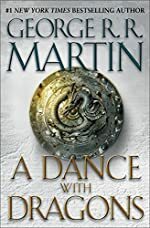 If you've been enjoying Game of Thrones on HBO, you'll be happy to learn that the fifth book in the "A Song of Ice and Fire" series of fantasy/adventure books by George R. R. Martin, A Dance with Dragons, is available to pre-order. It is scheduled to be published this July. Game of Thrones is adapted from the first book in the series, A Game of Thrones. It's been a long six years since the previous book in the series, A Feast for Crows, was published, and with A Dance with Dragons weighing in at 1200 pages, there's a lot of material to cover. In the aftermath of a colossal battle, the future of the Seven Kingdoms hangs in the balance once again -- beset by newly emerging threats from every direction. In the east, Daenerys Targaryen, the last scion of House Targaryen, rules with her three dragons as queen of a city built on dust and death. But Daenerys has three times three thousand enemies, and many have set out to find her. Yet, as they gather, one young man embarks upon his own quest for the queen, with an entirely different goal in mind. To the north lies the mammoth Wall of ice and stone -- a structure only as strong as those guarding it. There, Jon Snow, 998th Lord Commander of the Night's Watch, will face his greatest challenge yet. For he has powerful foes not only within the Watch but also beyond, in the land of the creatures of ice. And from all corners, bitter conflicts soon reignite, intimate betrayals are perpetrated, and a grand cast of outlaws and priests, soldiers and skinchangers, nobles and slaves, will face seemingly insurmountable obstacles. Some will fail, others will grow in the strength of darkness. But in a time of rising restlessness, the tides of destiny and politics will lead inevitably to the greatest dance of all. The nominees for the 2011 Arthur Ellis Awards have been announced by the Crime Writers of Canada, recognizing excellence in Canadian crime writing. The winners will be announced at an award banquet on June 2nd, 2011 at the Grand Pacific Hotel in Victoria, BC. 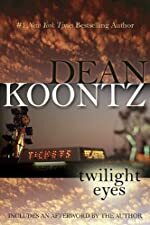 Starz is developing a project, expected to be an 8-part miniseries, adapted from Twilight Eyes, the story of a man with psychic powers by Dean Koontz. If completed, it would mark the cable network's first original series. Twilight Eyes features Slim MacKenzie, a young man blessed -- or cursed -- with the ability to see those that are out there lurking in the darkest shadows of an eerie, moonlit carnival. Feeding their twisted needs with human suffering. And fiendishly plotting the downfall of the human race. They're out there -- unseen by normal eyes, all too visible to Slim -- but don't scream. They'll hear you. Originally published in 1985, the adaptation is expected to be updated to take place in the current day. Koontz will co-executive produce with his former agent Rob Lee and Stephen Tolkin, who previously adapted two of the author's novels for television and who will also write the screenplay for this one. Will the next Jack Ryan film ever get made? Yet another screenwriter, David Koepp, has come on board to rewrite the script for a prequel to the series of films already adapted from Tom Clancy's novels, previously starring Alec Baldwin, Harrison Ford, and Ben Affleck as CIA agent Jack Ryan. Chris Pine is lined up for the role in this "origin" story, how Ryan came to be with the CIA, but the script for the untitled film -- not adapted from any of Clancy's novels -- has proved to be a real stumbling block. The storyline is still believed to be based on Adam Cozad's original outline for a completely different film that was repurposed to be the Jack Ryan backstory, involving the circumstances surrounding his survival of a helicopter crash while serving in the Marines. Several screenwriters have come and gone since then. Koepp has considerable experience in franchise films, having written or co-written the screenplays for two of the Jurassic Park movies, the original Mission: Impossible film based on the TV series, the third Indiana Jones movie, and Angels & Demons, adapted from the Dan Brown bestseller. Paramount, which is behind the project, hopes to start production early in 2012. A list of the top 15 mystery hardcover bestsellers for the week ending April 29th, 2011 has been posted by the Hidden Staircase Mystery Books. Just a bit of shuffling among the top bestselling crime novels this week, with Michael Connelly's 4th Mickey Haller legal thriller, The Fifth Witness, retaining the top spot this week. No new titles debut in the top 15, but one, almost certain to move up next week, enters the list at number 16. 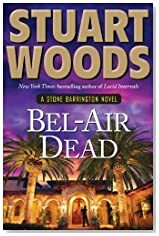 In Bel-Air Dead, the 20th thriller to feature Stone Barrington by Stuart Woods, the attorney receives a rather unexpected phone call from Arrington Calder, the ex-girlfriend with whom he has a son. Arrington's much older husband, the actor Vance Calder, has just died, leaving her a fortune in Centurion Studios stock. Arrington has plans for the money and asks Stone to represent her in the sale of the company. But when he arrives at her home in Bel-Air to finalize the deal, things take a nasty turn. It seems many of Hollywood's rich and beautiful have Arrington and Centurion in their sights, and Stone finds himself dragged into a surprisingly deadly web of intrigue. The winners of the 2011 Edgar Awards were announced this evening, given annually by the Mystery Writers of America to honor the best in mystery writing. ◊ Best Fact Crime: Scoreboard, Baby: A Story of College Football, Crime and Complicity by Nick Perry (University of Nebraska Press). ◊ Best Critical Biographical: Charlie Chan: The Untold Story of the Honorable Detective and his Rendezvouz with American History by Yunte Huang (Norton). ◊ Best Short Story: "The Scent of Lilacs" by Doug Allyn (Ellery Queen Mystery Magazine). ◊ Best Juvenile: The Buddy Files: The Case of the Lost Boy by Dori Hillestad (Albert Whitman). ◊ Best Play: "The Psychic" by Sam Bobrick (Falcon Theatre, Burbank CA). ◊ Best TV Episode: "Luther", Episode 1. Teleplay by Neil Cross (BBC America). ◊ Robert L. Fish Memorial Award: "Skyler Hobbs and the Rabbit Man" by Evan Lewis (Ellery Queen Mystery Magazine). ◊ Grand Master: Sara Paretsky. Nine Man's Murder by Eric Keith. Non-series. Ransom Note Press Trade Paperback, March 2011. The plot of this carefully crafted, meticulously detailed mystery is certainly familiar, but that does not detract in any way from the appeal of the book. Readers will be kept in suspect from nearly the very beginning as to "whodunit" in this affectionate homage to Agatha Christie's And Then There Were None. 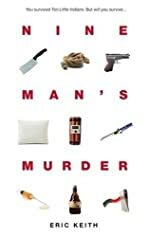 Read the full text of our review at Mysterious Reviews: Nine Man's Murder by Eric Keith. Read the first chapter(s) of Nine Man's Murder below. Use the Aa settings button to adjust text size, line spacing, and word density. June Jam by Ron Roy. A Calendar Mystery. Random House Mass Market Paperback, March 2011. The Pinto kids and their friends are at the top of their game here, coming up with creative ways of identifying the something -- or someone -- that is munching their way through the family strawberry patch, and ruining plans for a special treat for their Dad on Father's Day. 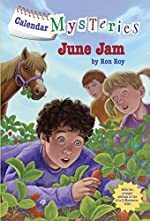 Read the full text of our review at Mysterious Reviews: June Jam by Ron Roy. Read the first chapter(s) of June Jam below. Use the Aa settings button to adjust text size, line spacing, and word density. R. L. Stine's soon to be published children's book It's the First Day of School ... Forever! has been optioned by the Gotham Group, which intends to adapt it for a family-themed adventure film. The production company is also involved with the film adaptation of another young adult thriller, The Maze Runner by James Dashner. In Stine's new book, Artie falls out of bed and hits his head -- hard -- on the first day of school. His Mom tells him he's just nervous because it's the first day of school. But then his brother gets syrup in his hair just as he's leaving home, and on the way to school he gets splashed by a puddle. It's not just the first day of school ... it's the worst day of school. On the second day of school, Artie falls out of bed and hits his head -- hard. His Mom tells him he's just nervous because it's the first day of school. Huh? 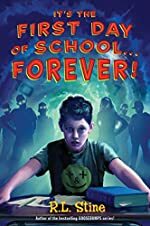 Artie's in a loop and must find a way out, before it's the first day of school ... forever! R. L. Stine is the author of over 300 books for children, which have sold over 400 million copies worldwide. He will serve as Thrillermaster at this year's ThrillerFest, July 6th through 9th, in Manhattan. 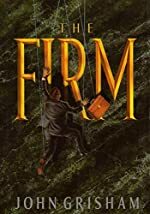 Entertainment One and Sony Pictures Television have agreed to co-produce a television series based on characters introduced in The Firm, the 1991 legal thriller by John Grisham. The book was previously adapted for the 1993 film of the same title, starring Tom Cruise. The storyline reportedly takes place 10 years after the events in the book, as attorney Mitchell McDeere and his family emerge from the witness protection program. Grisham will co-executive produce. An international distribution deal is already in place. Though CBS was originally part of the development team, NBC is now considered the front-runner to air The Firm in the US. Production is expected to begin on the 22-episode series this summer in Canada. 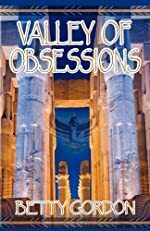 Omnimystery News is pleased to welcome Betty Gordon, whose new mystery, Valley of Obsessions (L & L Dreamspell, March 2011 Trade Paperback, 978-1-60318-282-9), is set in Egypt and based in part on her own visit to the country. Egypt, a land of enduring enchantment and intrigue, is the framework for Valley of Obsessions. To enjoy Egypt’s beauty and history, however, it’s necessary to push 2011 happenings in the country into the background and recognize them as troubled signs of the times. Fortunately, Desiree Roberts, a Texas woman and protagonist in this novel, didn’t have to suspend her belief in this magnificent country in the 1980s. The concept for the story and characters began when I made a trip to Egypt some years ago. The pharaohs, the monuments – everything about the country intrigued me and had done so since childhood when I could only look at pyramids in picture books. I decided during this memorable trip to write about my adventures although the actual words wouldn’t come to life until much later. Many unbelievable things happened during my journey to this impressive country and these happenings are woven into the story. Of course, not ALL occurrences are real and even those that are have been fictionalized to a certain extent. My publisher asked me to sketch certain prominent places in the story and also wanted to use photographs I had taken on my trip. Readers will see the sketches; however, the photos didn’t transfer well and all but one went by the wayside. As one can see, the setting for this novel wrapped itself around me just waiting to see print. My characters usually evolve from my imagination when I first enter the twilight zone at night. Unfortunately, oftentimes these thoughts keep me from sleep and I end up at the computer describing a character or creating a budding plot. Desiree Roberts, the protagonist in Valley of Obsessions, is a natural for me as I wore a hat as a paralegal/legal assistant for many years. So, I understand this woman who searches for ways to unite with a fascinating country in a special way and find love at the same time. Most of the time I am what one would call a “pantser.” I develop the story as I write, but this novel evolved in a way that required some outlining. Even though I write down the characters’ traits when I begin the story, their personality quirks develop much later and are capable of changing the direction of the story. My Muse usually takes over at this point and uses the personality quirks to create numerous tantalizing threads in the cast of characters. I think, and hope, that these tantalizing threads lead to a conclusion that is both challenging and surprising for readers. Betty is an active member of Mystery Writers of America, Sisters in Crime, Writers’ League of Texas, Houston Writers Guild, The Final Twist Writers, and Bay Area Writers’ League. Valley of Obsessions, her third novel, follows Murder in the Third Person and Deceptive Clarity. She is the author of a mini-ebook, The Magic of Christmas, a collection of short stories for every day of the year that embrace discoveries, hopes, and love. Suspense, fantasy, paranormal, and romance themes offer surprising twists and turns. She has also published numerous short stories in L&L Dreamspell anthologies. Betty’s dream to create stories that entertain and challenge readers continues in her new works. Visit her website at BettyGordon.com. About Valley of Obsessions: Can a Texas woman, Desiree Roberts, leave her law career and become a 1980s Egyptian? Will the country that has captivated her since childhood embrace her or will it lead her down dangerous paths fraught with deception and betrayal? Join Desiree as she treks through shifting sands, enters portals of pharaohs long since entombed, and explores the mysteries of the Nile. Her obsessions lure her into alien territory filled with suspicious characters. Someone wants to end her fantasies. How far will he go? Valley of Obsessions is available in Trade Paperback and Kindle formats (see icons below book cover). Read the first chapter of Valley of Obsessions below; use the Aa settings button to adjust font size, line spacing, and word density. Killer Nashville is once again sponsoring the annual Claymore Award for best unpublished crime novel. If you or someone you know is looking for an agent or publisher, this may be your opportunity to get visibility for your book. Judges will consider any subgenre of the crime novel, including thriller, cozy, private eye, police procedural, romantic suspense, historical and paranormal mysteries. The winner will receive consideration for publication by partnering publisher Five Star, an imprint of Gale, which is part of Cengage Learning. Five Star has been publishing mysteries since 1998. The top 10 finalists all receive prizes. Submissions must be received no later than May 20th, 2011. The winner will be announced at Killer Nashville, held from August 26th through 28th in Nashville, Tennessee. Read the complete set of rules here. 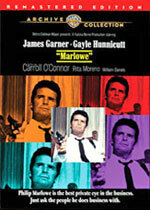 Warner Bros. has released a newly remastered edition of Marlowe , the 1969 adaptation of Raymond Chandler's The Little Sister, starring James Garner as private eye Philip Marlowe. Garner’s easy-going style contrasts agreeably with the grim task of sleuthing a case of missing persons, blackmail and ice-pick murders. Carroll O’Connor, Rita Moreno, William Daniels, Sharon Farrell and Jackie Coogan are among the cast of characters living in a sprawling ’60s L.A. so hard-boiled somebody’s got to crack. And when that happens, it's Marlowe’s job to put the pieces together. This made-to-order DVD is only available through WBShop.com . Watch the original trailer for the film below. Earlier this year we featured a teaser trailer for a video game based on the film (and by extension, the novel) Jurassic Park, which was expected to be released this month. This week, Telltale Games announced Jurassic Park: The Game would be delayed. "We'll be investing the extra time into making the game great and it will be released simultaneously on every platform this fall," said Dan Connors, CEO of Telltale Games. "We regret any disappointment on the part of our fans but we are confident you'll be pleased with our decision when the game comes out." In a gesture that is sure to win over customers, if you've pre-ordered the game, you'll not only get a full refund but you'll also get a voucher to purchase any Telltale game free ... even Jurassic Park: The Game when it is released. Though it's known that the gameplay takes place in the same timeframe as the first Jurassic Park film, the company promises more details later this summer.